Floor marking is the process of using visual cues such as lines, shapes, and signs on floors to make a space easier for people to navigate. These cues divide spaces, highlight hazards, outline workstations and storage locations, direct traffic, and convey important safety or instructional information. Floor marking is often part of a larger visual communication system that includes wall signs and labels. The floor tape finder helps you choose the right floor tape for your job. Floor marking is usually done using paint or adhesive products including floor marking tape, floor signs, and floor marking shapes. Tapes come in a variety of styles that have different colors, materials, and thicknesses. You can select tapes based on the conditions (such as traffic levels, hazards present, work performed, etc.) of the space you'll be marking. Floor markings are a common topic of discussion in the manufacturing and warehousing industries. If you don't know the benefits of floor markings or where to use them, this can be confusing. The following are some key reasons why so many facilities use industrial floor markings. Organizational Improvement - Any increase in organization at a facility will reduce wasted time and energy. Identifying storage or staging areas, for example, can quickly let people know where things need to be. Finding First Aid Equipment - In the event of an emergency, every second is critical. Having floor markings that can lead employees or emergency responders to things like fire extinguishers, emergency eye wash stations, first aid kits, and automated electronic defibrillators (AEDs) can minimize injury or even avoid deaths. Lean & 5S Methodologies - When following the lean or 5S methodologies to eliminate waste in your facility, you can benefit from using proper floor markings. You can also follow the 5S floor marking color standards to maximize effectiveness. Personal Protection Equipment - Using floor markings to alert people to when PPE is necessary is very effective. For example, your facility may use a dotted red line to indicate respiratory protection is required beyond a set point. Navigation Assistance - Given the size and scope of many facilities, having floor markings to guide people can be very helpful. One color may lead to the nearest exit, another color to the main office, and so on. Placement of Objects - There are hundreds or even thousands of objects placed throughout most facilities. Things like pallets, inventory, garbage cans, and more. Using floor markings to indicate where they should be placed when not in use can help improve organization. Traffic Direction - Any areas where there are vehicles driving, the floor markings can act like lines on a normal road. They can let people know where they should be driving, which direction, and even at what speed. Just make a set of traffic standards and train everyone on them. These are just a few of the most common uses for floor markings in a facility. What is floor marking tape? Floor marking tape is a product used to create lines on a facility's floor. It is usually made from a durable material such as vinyl. Many types of tape are available including SafetyTac® industrial floor tape, Smart Stripe Tape, 5S Tape™, reflective tape, traction tape, glow-in-the-dark tape, and striped hazard tape. Each tape has a specific thickness and durability level, making some good for areas with forklift traffic and others better suited to areas with only pedestrian traffic. Most tapes come in a variety of colors and patterns so you can create a floor tape color scheme. What is the best floor marking tape? There is no best floor marking tape for all applications. A business should instead select a tape that has qualities most appropriate for the spaces they will be marking. For example, if an area has high forklift traffic, a thick, heavy-duty tape such as SafetyTac® 2.0 would be most appropriate. On the other hand, an area with limited traffic could use a much thinner tape. Try using this Floor Tape Finder to help you select the best tape for your space. How do I apply floor marking tape? Installing floor marking tape isn't complicated. First, sweep the floor and clean it with a mild detergent that does not leave a residue. Let the floor dry. If the tape has a backing, begin peeling it off at one end and applying the tape to the floor. Once you've finished applying a line of tape, apply pressure to it. For heavy-duty tapes, you can push a tamper cart over the tape or use another heavy piece of equipment. For lighter-duty tapes, you can walk on the tape. Alternatively, you can use an industrial applicator to apply the tape in straight lines and apply pressure at the same time. How do I remove floor marking tape? To remove floor tape, scrape up an end of the tape and pull it straight up (almost at a 90 degree angle). You should be able to pull up the tape in fairly large sections. What are floor marking tape guidelines? OSHA does not have very specific guidelines for floor tape (the agency only states in 29 CFR 1910.22 that 'permanent aisles and passageways shall be appropriately marked'). Many industries consider it best practices to use floor tape to mark hazards, work cells, and other important areas, though. You can learn more about floor marking tape guidelines in the section of this article about colors codes. Warehouses are often large and busy. With people walking, vehicles driving, and other items moving, it is essential everyone knows what they are doing and where they are going. Warehouse aisle signs can help keep everyone moving efficiently and safely. Keeping Them Clean - Floor marking tape and signs can typically be cleaned using the same products used on the rest of the floor. Proper Application - A smooth application will ensure the tape has a long life, even with indoor vehicles driving over it and people walking on it. Follow Color Standards - If you have floor marking color standards in place, make sure you use them with warehouse aisle signs to ensure a uniform system for your visual workplace. Following the color standards for floor marking doesn't have to be difficult. The following are common colors used for floor marking. You can also make your own standards if you have to convey a set message using colored floor markings. Just make sure that everyone in the facility knows of the standard and it is followed properly. Yellow tape (or paint) should be used for all normal foot traffic going through aisles (both indoor and outdoor) as well as vehicle traffic. Smaller work areas can also be marked off using yellow tape. White tape should be used for anything related to facility equipment, fixtures, racks, carts, and things of this nature. Outlining them with white tape alerts people to their presence and also lets people know where to put them when they're done using them. These three colors are often used interchangeably because they can easily be confused with one another, especially in darker areas. They are often used near raw materials as well as around any finished goods or products that are in progress. Any products, materials, or supplies that are currently being held for inspection. Locations where defective products, scrap materials, or items in the facility that need to be reworked are stored. Any area that must be kept clear for safety or compliance should be marked with red and white tape. This will typically be placed around fire extinguishers, emergency eye wash stations, or fire lanes. Areas that need to be kept clear for general operations should be marked with black and white tape. This is not to be used for emergency or compliance areas. If there is a physical health hazard in an area, black and yellow tape should be used to mark the area. Minimize the Number of Colors - Using as few colors as possible will make it easier for your employees and guests of the facility to remember what each one means. Consistency is Essential - Follow the same standards throughout the facility. If your company has more than one facility, make sure the floor marking color standards are uniform across all locations. Training is Critical - Take the time to train all employees, contractors, and anyone else who will be spending time in the facility on a regular basis. People must know what each color means, especially during a high-stress time such as an emergency. More than Just Tape - Remember, the color codes should apply to more than just the lines on the floor. If you are using floor marking shapes or signs, the color standards should be consistent through it all. Post the Code - Having signs up in strategic locations throughout the facility that list the colors and what they mean will serve as a constant reminder and refresher of the training people receive. In some cases, these types of workplace postings are actually required. This will also help any guests who are in the facility if they need to quickly know what something means. Floor markings have been proven to improve visual communication within facilities, while also benefiting overall facility safety. The following are some proven scenarios where floor markings can be beneficial. Having tape in place to guide people through aisles can be very helpful. It can also show people moving equipment when they are attempting to turn corners too tightly. Using floor marking tape can help identify the proper positioning of things like trash bins, storage cabinets, indoor vehicles, and more. Many facilities are quite large, so having floor markings that will guide people to the nearest emergency exit can literally be lifesaving. Using non-slip floor marking tape can help improve traction, especially in areas where the floor is likely to be wet. Marking the floor with safety information can offer helpful tips at a glance. The ground in outdoor areas often needs to have proper marking to improve visual communication. This can be especially important at night when reflective floor tape can be used. Using tape to alert people to potential trip hazards can improve facility safety. Being able to follow the path of production can improve efficiency and allow employees to better track progress of production. When a specific hazard is present, such as chemicals or electrical shock risks, you can identify them from a distance using floor markings. Emergency equipment such as fire extinguishers, eye wash stations, and AEDs can be identified by floor markings. You can also ensure access to them won't be blocked by marking the floors around them. When you are putting floor markings on your facility you will be able to choose between floor marking paint and floor marking tape. In almost all situations, tape is going to provide many more benefits than paint. The following table will quickly illustrate different topics and show which of these two options is best in each one. As you can see, floor marking tape has a lot of advantages over paint. In virtually every situation floor marking tape is a much smarter choice. What is Floor Marking Tape Made From? General Floor Tape - The most common types of floor marking tape are made from vinyl, which can stand up to both foot and vehicle traffic. The glue is made using reinforced rubber-based industrial adhesive that can hold in almost any temperature and even stand up to water and chemicals. Glow-in-the-Dark Tape - Glow-in-the-dark tape, also known as photoluminescent tape, is made using a special phosphor that is applied to the vinyl tape. The industrial strength glue is still used. Reflective Tape - Reflective tape is made using thousands of tiny glass beads, prisms, and metals to create a reflective surface on top of the tape. It is sealed tightly to the tape so the materials will not come off during normal use. This surface will reflect light back toward the source, so it is easy to see even from a distance. No matter what type of floor tape or other floor markings you need in your facility, make sure you always order industrial grade to ensure it will be able to stand up to the wear and tear that it will experience on a daily basis. Similar to warehouse aisle signs, these markers can improve your visual workplace strategies. These markers, unlike most signs, typically convey a message using a combination of symbols, colors, and other non-written information (though some may include words as well). In addition to keeping floors clean and orderly, OSHA has long promoted floor markings in the workplace to improve overall facility safety. There are many types of warehouse aisle markers to choose from including things like arrows, footprints, and corner markings. Aisles or passageways that are permanent should be properly marked (using floor markings or other clear identifiers). Sufficient clearances must be in place for all aisles so that vehicles can safely maneuver. All passageways and aisles must be kept clean and free from hazardous obstacles (that may cover any safety markings). While there is a lot that forklift drivers can do to improve forklift safety, the facility can also contribute to solving this danger using floor markings. Using reflective floor markings to alert drivers to where a ledge is located, for example, can alert them to the danger even in dark areas. Glow-in-the-dark tape is made from a special phosphor that absorbs light radiation and then emits it back out. The process is known as photoluminescense and occurs when the phosphor gets "excited" so the protons within begin moving rapidly. When exposed to light, it will absorb the energy. The brighter the light, the more energy will be absorbed. As long as the phosphor has energy stored within it, the tape will glow. This can be hard to notice if there is a lot of ambient lighting, but once it is dark enough, the glow is easy to see. Reflective tape is made by using glass beads, prisms, and metals. Any light shined onto the tape will refract through the surfaces on the tape before it is finally reflected back, making it very visible. This tape comes in many colors and grades including those approved by the US Department of Transportation. The following table will help you to choose the right tape for the job. Bathrooms - Outlining toilets & sinks Excellent because it does not rely on a constant light source. Not recommended because there is no light to be reflected. Outdoor Visibility for People (Jogging, Halloween Costumes, etc.) Good option anywhere as it emits its own light. Only use for a few hours or less at a time. Only good near roads or other areas where light will be shined on the tape. Parking Lot Markings Ineffective because of the long duration that the light is needed. Ideal because vehicle headlights will illuminate the tape as needed. Aisle Markings in a Warehouse Ideal because lights are typically on to "charge" the tape. It will glow during power outages or other emergencies. Not recommended because most people in warehouses won't be using flashlights or headlights. While reflective or photoluminescent tape is a great option in some cases, it is not always necessary. Caution floor tape that does not light up will usually be more than enough. The important thing when choosing your floor tape is making sure you meet all of OSHA's rules for floor markings. To ensure you meet every requirement, it is a good idea to not just go through the OSHA list of recommended floor markings, but learn about what makes a safe floor in general. Having clear markings is a great start, but you must make sure the floor is not slippery and is generally safe as well. Safety Footprints - Footprint-shaped floor graphics are a great way to show people which way they should be walking. Squared Corners - Whenever there is a corner along a warehouse aisle or other area, make sure it is properly marked so people know to watch out for moving vehicles or other hazards. Rounded Corners - Some facilities prefer rounded corners to make a smoother and cleaner look. Whether squared or rounded, marking corners is very important. Stop Floor Sign - In some situations it is easier for people to see a stop sign placed on the floor than it is to see one on a post. Combining the two can improve workplace visual communications. Safety X's - As the saying goes, X marks the spot. X-shaped floor graphics can indicate where any number of things should go in your facility. Dots - Even simple dots can convey a clear message that people can see from a great distance. They can be color coded too. One of the best things about all of these types of floor stickers is they are extremely easy to apply. Whether they will be used as floor caution tape or sports floor markings or simple yellow warning tape, you really just remove the protective backing and apply them to a clean floor. Once they are in place, apply weight by walking or rolling a heavy object over them. This will help secure them so they won't come up for a long time. While it is extremely simple to apply floor stickers in you facility, it will go a long way in promoting safety in the workplace. Floor markings aren't just for improving visual communication in the facility. They can also be used to directly increase safety by reducing the chances of slip and fall accidents. Non-slip floor tape is made to help people retain traction, even if the area is wet, dirty, or otherwise slippery. This is done by creating a rough surface on the tape that helps to maintain contact between employee's shoes and the tape itself. No slip tape comes in long strips like normal tape or in shapes to apply to specific areas. This makes it possible for you to do things like add warehouse floor striping or even add floor tape to gyms where it can sometimes get wet. You can even use clear floor tape that can add to traction without conveying any visible message at all. This is an easy and affordable option for many facilities. With so many options, it can be difficult to find the right warehouse floor tape for your needs. While looking through a floor tape store, make sure you have a general floor marking guide in mind. Plan out what types of floor markings you will need in your facility and then pick out the products that will best meet your needs. There are many recommendations out there from OSHA and other agencies regarding how you should mark your floors. While they can be useful, you need to remember that every facility is unique and has its own set of requirements. Whenever using any type of safety tape, make sure you have the right line marking equipment to install it properly. When installing long lines, you can use a simple roller device known as an Industrial Applicator that will apply the tape on the floor in a straight line while also applying pressure to ensure it sticks properly. While that is a great tool for straight lines, you'll also need to make sure you know how to properly apply tape around corners. This is also an easy process. You can either use pre-made corner pieces or follow the techniques listed in the linked video to quickly turn corners throughout your facility. Floor marking tape of all types is made to stick securely to the floor so it doesn't have to be replaced or repaired for a long time. There are situations, however, when you will want to get rid of tape. By simply scraping up a starting point and then pulling it up at almost a 90-degree angle, you should be able to pull up long pieces of tape at a time. Removing floor marking tape is simpler than most people would expect, as long as you follow the above-mentioned technique. While using floor markings is a fast and easy way to improve facility safety and efficiency, there are some common mistakes you'll need to avoid. Look through the following common floor marking mistakes and learn from the errors of other facilities. 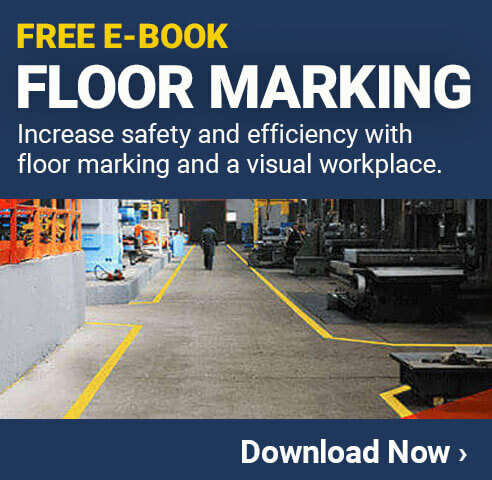 This will help you maximize the effectiveness of your overall floor marking strategy. Following color standards is absolutely essential. Even if the colors for a set area are not mandated by law or things like 5S methodologies, it is important to standardize them within your company so they clearly convey the desired message. Many facilities only use floor marking tape and avoid the use of floor marking shapes. These shapes can clearly convey a message and should be used in almost all facilities. Installing floor markings improperly will reduce their lifespan and may also cause them to be less effective. Following proper installation standards can dramatically improve the results. Cleaning your floor markings is essential, otherwise the message they convey can become unclear. Floor markings that are not cleaned won't last nearly as long. Even the best planned floor marking strategy will be ineffective if everyone in the facility is not trained on how to interpret the meanings of all the tape and other markings. While high-quality floor markings can last a long time, they can't last forever. Replacing or repairing damaged or worn floor markings is essential for a good floor marking strategy. Using the wrong markings based on location can cause them to wear out more quickly or become ineffective.